RHS senior, Abbey Mcdowell has been a part of the Ringgold Marching Tiger Band color guard since 2015. The colorguard starts working in the summer with the marching band to prepare for Friday nights. What many people may not know is that some of these girls continue through the winter season competing for the Ringgold High School guard. 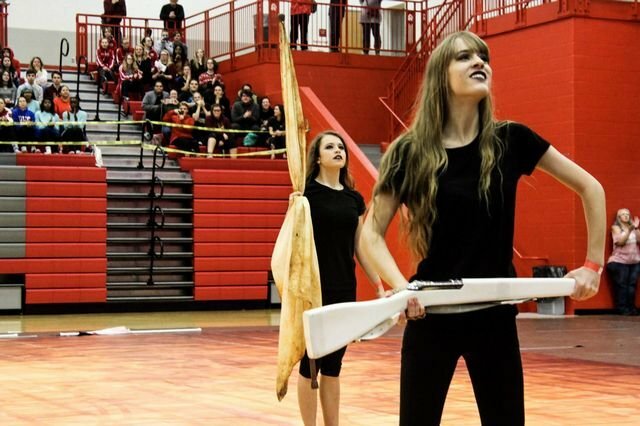 Winterguard is an indoor activity that includes rifles, sabres and lots of dancing. Abbey was the captain this year, and it has played a big role in her life. “Guard has given me confidence in myself that I never thought that I would have,” Abbey said. The guard has been competed in many championships including being the 2016 SAPA Grand Champions with their show “Serenity“. Abbey stated, “I was amazed on how far the guard got that year due to of all the hardships that were thrown our way; I was proud of all the hard work that everyone has put in.” The RMTB guard has received first in colour guard at numerous competitions throughout the years. Abbey, along with the rest of the guard, has worked extremely hard to complete work and to make the show perfect. On Saturday, January 19th, the Ringgold guard competed at the Art of the Warrior at Lakeview High School in Fort Oglethorpe. After hours and hours of work, the guard received third in their class with show called “Architect”. At the competition, there were 36 register units from all over Georgia and parts of Tennessee. Abbey says, “This show has been the most challenging.” It has included many rifle and sabre tricks under the tosses which adds difficulty. Ringgold has thirteen of the hardest working girls, and they continue to never give up and always do their best.